Thanks to Lauren from Scrapbook Lives for tagging me in her post, asking what's in my make up bag. I was really keen to take part, since I've only recently started wearing make up more often. I used to only wear it for evenings out, but since hitting 30ish, plus VAT, I am finding I resemble the unfortunate victim of a Miss Marple episode, if I don't make at least a bit of an effort. 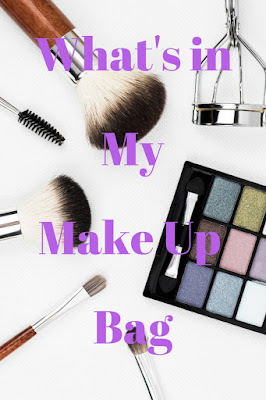 So this post features the products I love enough to give them their own bag. In most cases, it's because they are great products, but there's at least one that I only keep in there for the name. Welcome to the shallow world of my make up bag! This is probably the oldest product in my make up bag. I'm not sure how old, exactly, but I recommend not being me and replacing anything that goes near your eyes every so often. I looked into this and according to Your Sight Matters you should replace eye make up every six months, but other websites say one to two years, if it's not next to your eye, such as mascara or eyeliner. 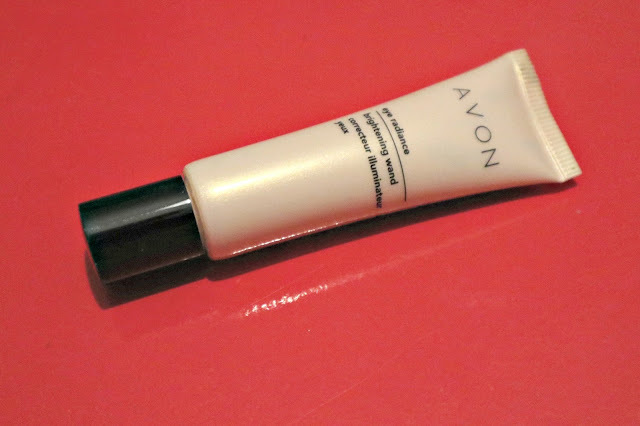 Part of the reason why I am clinging on to this Avon Eye Radiance Brightening Wand is because, as often happens with Avon, they appear to have discontinued it. They have lots of similar concealers, in various shapes and sizes, but I like this exact one, because I am used to using this exact one. I like the little applicator on the end, I like the consistency and I even like the size of the little tube. This is the one thing that drives me crazy about Avon, I find a product I absolutely love, then suddenly I can't buy it anymore. This leads me nicely on to my next make up bag essential. 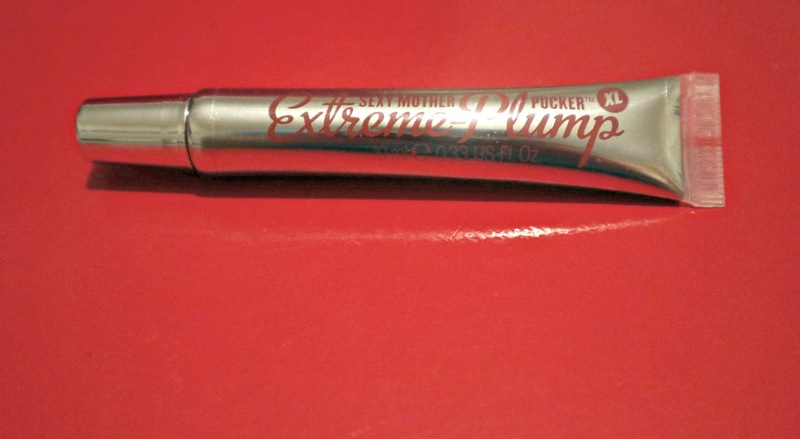 I can't tell you how chuffed I was to recently discover this Extreme Lip Plump lip gloss from Soap and Glory. 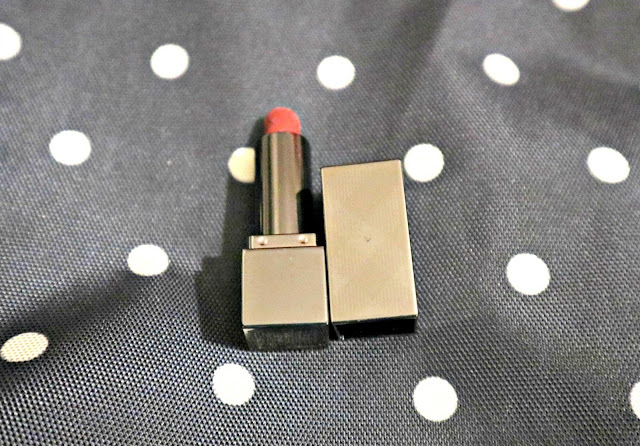 For years I used a similar product from Avon; you apply it to your lips and it sort of tingles a bit and, sure enough, your lips plump up, giving you the youthful pout of a teenager, and not a harassed mother in her... thirties and a bit. Alas, Avon discontinued it and I have been bereft until just a few weeks ago, when I treated myself to a Soap and Glory gift set in the Boots annual January 70% off sale. Honestly, if you've never been, it's worth a trip. You have to keep popping in, or keep an eye out on social media, because they are always a bit vague about when it starts, but I buy all my bath and beauty products for the year, it's amazing. The Soap and Glory gift set, for example, was originally £50, with products worth £68, and I got it for £15! The lip gloss on it's own is normally £10 and there were lots of other lovely, useful make up products too. I have, what is known in the beauty world as 'wayward eyebrows'. I imagine it's because I have curly hair, but, whatever the reason, my eyebrows, if left unsupervised, take on a mind of their own and without any kind of intervention, it wouldn't be long before I resembled Dennis Healy. Imagine two really electrified caterpillars challenging each other to a fight. It's not a good look and I am grateful for any help I can get, because I am not the best at eyebrow topiary. I have a tendency to over pluck, because I can never be 100% sure which of the unruly gang is actually the ringleader. 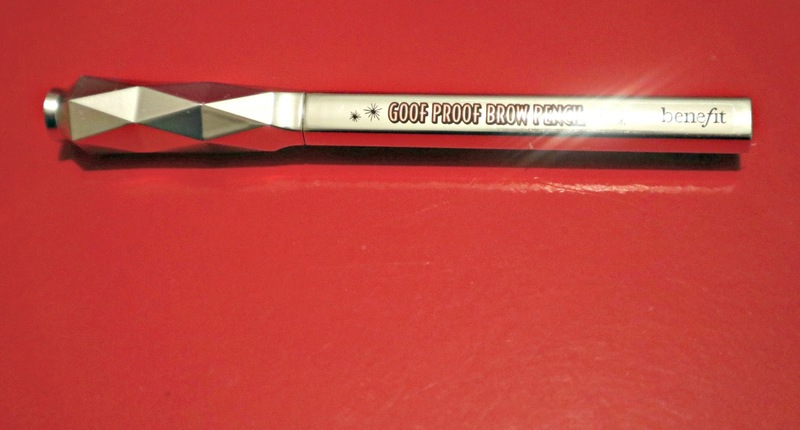 Fortunately, Benefit have my back, with this does-exactly-what-it-says Goof Proof Brow Pencil. It has a brilliant tapered end, so that you can make really delicate strokes and you won't end up looking like you did your eyebrows with a Sharpie. Because that happens sometimes, doesn't it, YouTube? And here it is, the product I probably don't need, but my goodness, it's pretty! I couldn't photograph this one on a red background, for obvious reasons, so it's already the odd one out. I don't really wear lipstick, but this one is by Burberry, and it's cute and shiny and perfect for getting out and pretending to use in those really posh toilets that have hand lotion instead of just soap and strategically placed pebbles everywhere. If I ever do get around to wearing proper make up, like a big girl, I'm sure this would be my lipstick of choice but, for now, it's more of a show lipstick. What I do wear, sometimes, is a really good quality lip tint. I'll be honest, I'm just not very good at applying make up. If I attempt any more than a light dusting of eye shadow, I end up with a look that's somewhere between angry clown, and recently dumped drag queen. A lip tint I can just about cope with, especially my current choice; Beach Tint, from Becca, in Raspberry. You can use it on cheeks or lips and it goes on really easily for a subtle blush of colour without any drama. The last item lurking right in the bottom of my make up bag, is Bourjois Volume 1 Seconde mascara. Despite having really dark eyelashes anyway, I am finding recently that a good mascara makes me look more awake and, well, not dead. This is very quick and easy to use and gives just the right amount of oomph, without too much clumpy obviousness. 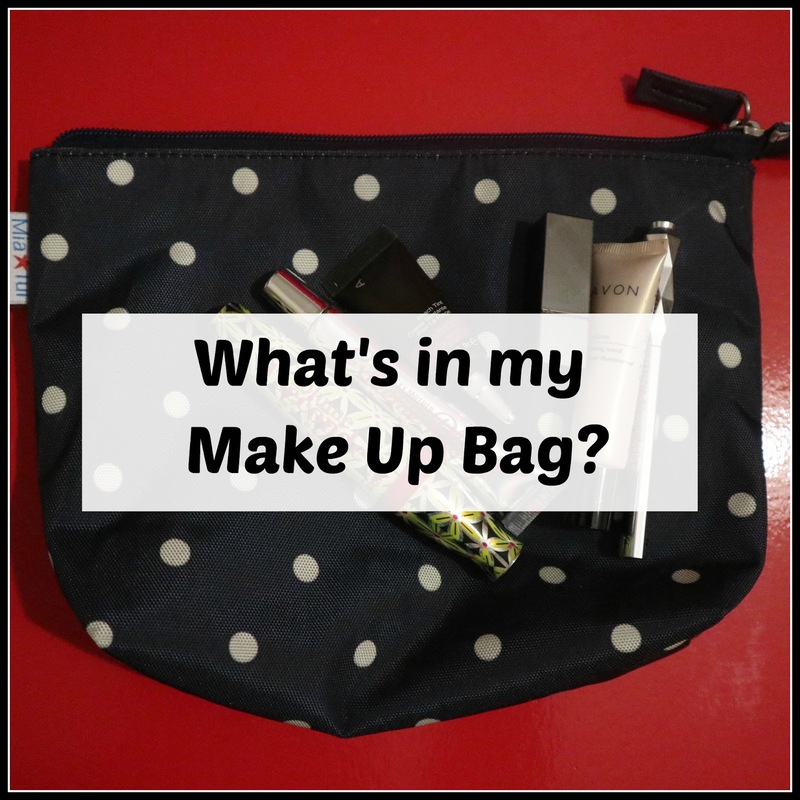 My make-up bag is by Mia Tui, who I highly recommend. They put so much thought into all their bags and you will find a world of different pockets and sections to keep everything safe and secure. I hope you have enjoyed this foray into the world of my cosmetics. 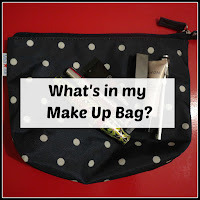 I would like to pass on the beauty baton by asking Nicola, from Mummy to Dex, Hayley from Devon Mama and Mel from Le Coin de Mel what's lurking in their make up bags? Love this! Yes mascara helps to make me look less dead too! Ive used that Benefit brow pencil too and really rate it! Thanks for joining in! I use a light concealer, a cream blush and a mascara for day to day make up. I try to replace mine regularly, but I too cling onto products that have been discontinued. Avon is such a good and affordable brand, I used to buy lots from them a few years back when I lived somewhere different and you ordered it from home. 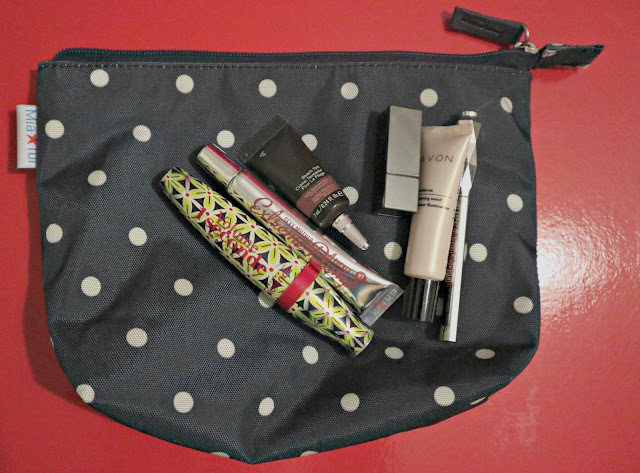 Love the look of the products here especially the Avon product. Ooh I am super nosy so I loved reading this! I never wear make up really unless I'm going somewhere I want to look half human, haha! I love reading these type of posts. The brow pencil is one of my favourites.